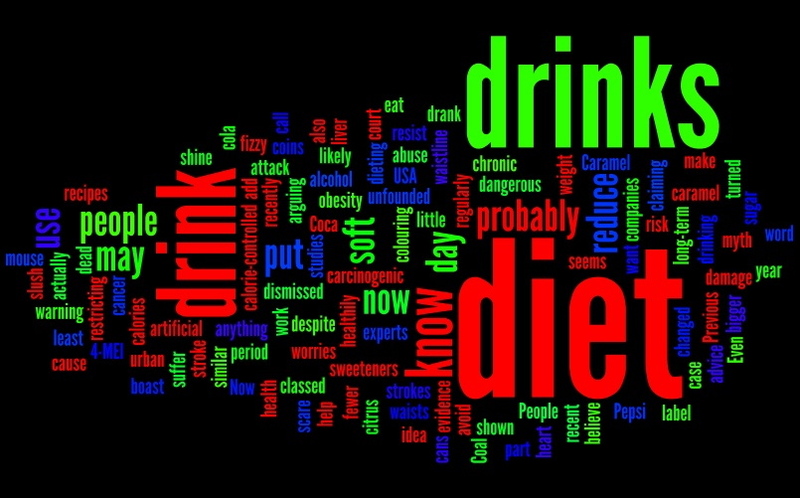 Diet drinks are not good for you! You know by now that dieting only work for about 10% of those who do it. You probably know you should eat healthily. You should also know that diet drinks are dangerous. You may have dismissed as an urban myth the idea that you can use cola to shine up coins or the dead mouse in a can of citrus soft drink which had turned to slush (a recent court case in USA). Now experts believe that people who drink as little as 1 can of fizzy diet drink a day are over 40% more likely to suffer from a stroke or heart attack. Previous studies have shown that while diet drinks may boast no sugar but use artificial sweeteners which can cause long-term liver damage similar to chronic alcohol abuse. And now it seems that despite diet drinks claiming to have fewer calories they can actually make you put on weight. People who regularly drank diet drinks over a 10 year period had 70% bigger waists than people who didn’t drink them. Even restricting yourself to 2 diet drinks a day can add 2″ to your waistline. The soft drink companies resist this evidence arguing that drinking diet drinks as part of a calorie-controlled diet can help reduce obesity and reduce the risk of strokes. My advice is avoid anything with the word diet in it! And it’s not only the diet drinks. Both Pepsi and Coca Coal have recently changed their recipes because of what they call an unfounded cancer scare (the caramel colouring 4-MEI is classed as carcinogenic) but they don’t want to have to put a health warning label on their cans. Caramel is probably the least of your worries. This entry was posted in Health, Lifestyle and tagged carcinogen, Coca Cola, diet, diet drinks, Pepsi, waist size. Do you have a technical mind?